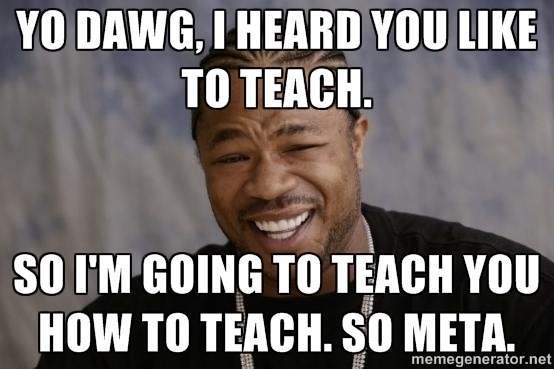 Yo dawg, I heard you like to teach. So I’m going to teach you how to teach. I am so meta. Yes, this article is not going to teach about production, rather, it will teach about teaching production. Like inception, but with education. Eduception? Teaching is not as easy as it seems. You have to communicate ideas in a way that are simple enough to be easily digested, yet thorough enough to cover what are oftentimes complex concepts. You have to inspire students to not just learn, but also continue learning. No, it is not easy at all. But here’s a few ideas that will simplify this complex pursuit. Providing information is what teaching looks like on the surface. Unfortunately, information is easily obtained, really only so useful, and can generally do as much bad as good. Most things in life revolve around application — the tacit understanding of what to do with information. And that’s much more difficult to communicate. Think about things this way: You are in a position to teach because you have amassed a certain degree of experience. That experience involved being taught by others, learning through experimentation, and doing things by accident that revealed something pertinent. It’s a process of a lot of repetition being informed by little variances over a long period of time. We want to shorten that period of time for the student. We want to provide circumstances that lend themselves to experimentation — trial and error. In the particular world of music production this involves less teaching of technique and more providing the student with goals. For example, let’s take a standard topic: mixing drums. Rather than going straight for techniques, start with different interpretations of how drums can sit in a record. Then start negotiating the techniques that can affect these interpretations. 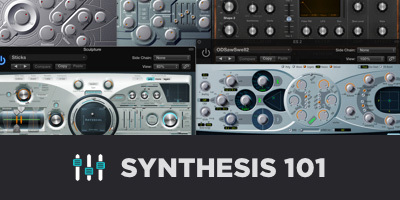 Understanding how to clean up a kit using expansion and EQ is one thing. Understanding the degree to which one can choose to do that or not do that is another. If you put the student in a position to explore different possibilities, they will learn all of the techniques within that sphere hands on and accelerate their experience in doing so. In fact, I actually repeated this phraseology quite a bit in that passage in less obvious ways. I habitually do this in most of my writing for the same reason one repeats the hook of a song. I want it to stick! The key to getting this down is to reiterate things rather than repeat them. In other words, you don’t want to simply say the same thing over and over again — that’s boring. You want to expand on the subject by elaborating and bringing up examples. Once that’s done you can consolidate your ideas. And in this way, you can reinforce the idea without making it monotonous. (I am so meta). Do you know the difference between “confidence” and “arrogance”? They both hinge on the ability to assert oneself. But where “confidence” can learn new things, “arrogance” already feels it knows everything. Where “confidence” can admit to being incorrect and move on, “arrogance” cannot. Teaching is very much about learning. This isn’t elementary school mathematics, it’s music production. We are sharing our experience. It stands to reason that while a less experienced mathematician cannot offer much to one who is more experienced, a less experienced artist can offer a great deal to his/her more experienced counterpart. This is important because teaching must be done as a dialogue. I ask myself the questions I once didn’t know the answers to, in order to provide for the learner. I also ask myself the questions I don’t know the answers to, and seek out the answers. I do this in order to give the learner and myself a more defined explanation. In doing so, I’ve opened up my knowledge base to the point that engineers and producers who vastly outweigh me in terms of experience are still able to learn from me. It’s important to accept ourselves as perpetual students. This reminds us of where we came from and how far we have come, and we can see those who are learning now as reflections of where we once were. This is a bit of an esoteric concept, but it’s important to teach to someone’s potential rather than to teach to their current ability. Ultimately this idea goes back to accelerating the learner’s experience by providing goals. Lift yourself up, by all means. There’s nothing wrong with reinforcing your own stature and commanding a degree of authority (although if you’re good at teaching you won’t really have to do that very much). But never put the learner down in the process. I think this is true in all fields of teaching but I think this is especially true in the arts. When I address a newer reader, I often use words like “learner” or “aspiring engineer”. And I’ll refer to those who have been at it for a while as “vetted producer” or “experienced mixer.” For one, I think those phrases are genuinely more accurate than say “newbie”, “student”, “amateur”, “professional”, etc. Let’s say I start referring to my readers/viewers as “amateurs.” First — I’ve alienated the countless professional engineers and producers that learn from my content. Second, I’ve given the learner a ceiling. By labeling them “amateur” they either a) stop listening when they become professional, or, b) start thinking of themselves perpetually as amateurs as that’s the idea that I keep repeating. And repetition is akin to reinforcement as I’ve said before. (I am SO meta). A boring class is an ineffective class. A monotonous lesson is a turn off. The learning process is already full of frustration and failures, so why make it boring to boot? If you have a personality, bring it to light. Keep up the pacing. And be a human, not a robot! Humans make mistakes — I’ve done so several times both in print and on camera. And that’s ok. Because everyone learning is also making mistakes. Find a way to make failures (dare I say) fun. Because it’s an important part of the process. Be ok with poking fun at yourself (my meta jokes are super dumb). Inserting little asides and distractions actually makes it easier for the learner to digest the information you are providing. Even when the ideas are complex. Notice how all of this stuff is making tons of sense and sinking in? That’s not an accident. It’s because I’m putting myself directly on your level, engaging you, reinforcing my ideas, and leading you to share my experience. And, I’m allowing myself the chance to make mistakes in doing so — so that you can feel ok making mistakes too. Or, if I were merely in the business of providing information I would say it like this: I’m imaging myself as the student, and teaching how I myself would feel most effectively taught.